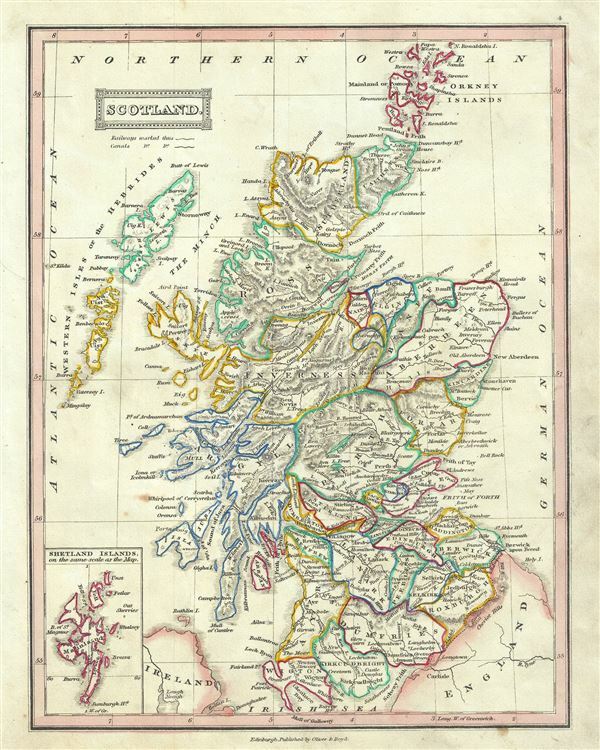 This is a beautiful example of Thomas Ewing's 1845 map of Scotland. It covers Scotland from the Orkney Islands to Wigton in the South inclusive of the Hebrides. An inset on the top left quadrant details the Shetland Islands. Various cities, towns, rivers, islands and other topographical details are marked, with relief shown by hachure. During this period, against the backdrop of the Industrial Revolution, during which Scotland flourished, the Church of Scotland witnessed a division in which many of its ministers, following a decade long conflict, broke away to form the Free Church of Scotland. Boundaries are color coded according to regions and territories. This map was published in 1845 by Oliver and Boyd as part of Ewing's New General Atlas. Oliver and Boyd, Ewing's New General Atlas: containing Distinct Maps of all the Principal States and Kingdoms throughout the World, (Edinburgh) 1845. Very good. Minor foxing at places. Blank on verso.